When I was in junior high and working at the local public library, somebody donated a book club edition of CRIME AND MR. CAMPION, an omnibus edition of three novels by Margery Allingham featuring her semi-amateur sleuth Albert Campion. Since I handled all the donations, I took this one home with me and read it before it ever went on the shelves, since I read quite a few British mysteries in those days. I remember enjoying the novels quite a bit, but that’s all I could tell you about them. 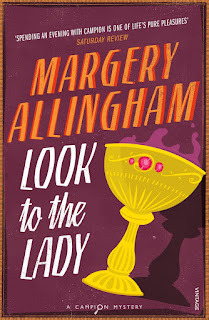 I never read anything else by Margery Allingham . . . until now. 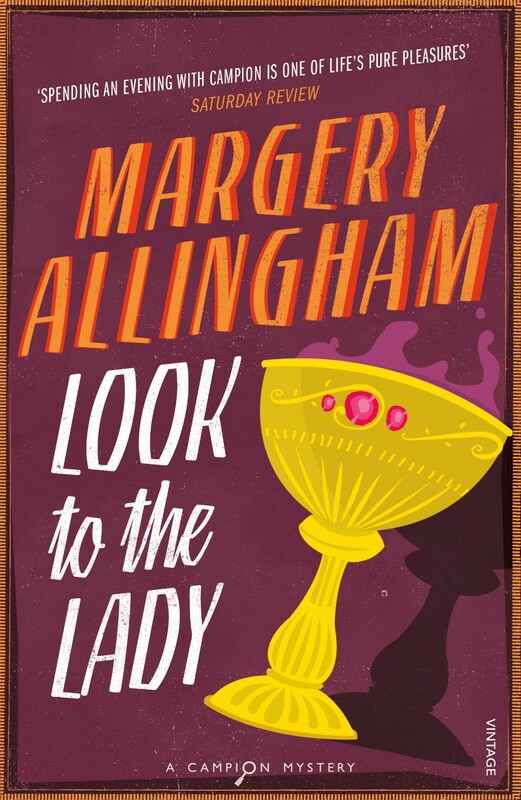 LOOK TO THE LADY, originally published in 1931, is the third book in the Campion series and the second in which he plays a major part. (He’s only a supporting player in the first one, THE CRIME AT BLACK DUDLEY.) In this one, Campion, who seems to be nothing more than a harmless aristocrat (he’s rumored to be a member of the royal family operating under a pseudonym because of his love for adventure), runs up against an international gang of thieves who specialize in stealing rare art treasures, the sort of thing that can’t be fenced but can be sold to unscrupulous private collectors. To start with, Campion foils the kidnapping of young Val Gyrth, whose family is charged with the safekeeping of the Gyrth Chalice, an early British relic more than a thousand years old. Knowing that the chalice is still in danger of being stolen, Campion and Val, accompanied by Campion’s servant Lugg (a reformed criminal who functions as both muscle and comedy relief), hie themselves off to the Gyrth country estate, where Val’s rather unpleasant aunt is promptly murdered. You’ve got sinister Gypsies lurking about, a visiting American professor and his beautiful daughter, an ancient tower with a hidden room in it, apparitions that apparently drive people mad, assorted crooks, and a race horse with a reputation as a killer. Even though there’s a murder that Campion solves (of course), and even though it’s set mostly on an English country estate, LOOK TO THE LADY is hardly the cozy mystery I was expecting. It’s a thriller more along the lines of Sax Rohmer or Edgar Wallace, with plenty of action, some supernatural overtones, and a surprising amount of screwball comedy. The dialogue between Campion and Lugg is often hilarious, and overall the book is fast-paced and lighthearted, although there are definitely some darker moments. The ending is particularly satisfying. I read this in an e-book edition, and I have a number of others, bought when they were on sale. I expect I’ll be reading another one before too much longer, because I really enjoyed LOOK TO THE LADY. Now this is truly amazing, James. I read this same book just last week. It came to light as my wife and I sorted through boxes of old books in our continuing effort to downsize effects after a move into smaller accommodation. The edition we have is a 1966 Macfadden paperpack reprint "published by arrangement with Doubleday & Company, Inc." who claim the 1931 copyright on the flip side of the title page. It has the American title for the novel, THE GYRTH CHALICE MYSTERY, which I think is more distinctive and memorable than the rather generic LOOK TO THE LADY, which could be applied to a vast number of thrillers. I agree with every one of your other comments. My thoughts are virtually identical. Like you I was expecting something cozy along 1930s British "Detection Club" lines. Did the ebook include the two maps: of Sanctuary and adjoining estates, and of the gypsy camp and Heronhoe Heath? Yep, the e-book edition does indeed include the two maps. I always like maps in mystery novels. Well, in any novels, I guess. That's one reason I always enjoy the Dell mapbacks.